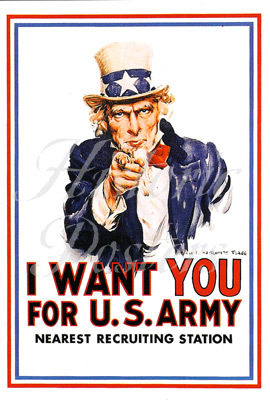 If you’re looking for reproductions of original military recruitment posters from World War I, World War II and other eras, you’re in the right place! Our vast selection includes everything from the famous Uncle Sam, I Want You to posters of Vietnam, Korea, Iwo Jima, Desert Storm, Marines, Navy Seals and more! Some of our posters are also available as magnets – which make an ideal souvenir or gift. Our postcard selection is almost as large as that of our posters, featuring almost all of our same military recruitment offerings, plus Civil War postcards, and some classics. And be sure to check out our boxed sets of Navy and Marines notecards. And we do offer 5 reproductions of original WPA (Works Progress Administration) posters from the 1930s. We also have a line of presidential caricature election posters from the late 1960s. Our University/College posters are all originals- line drawings, printed in the 1960s. Posters Inc., we’re more than posters. See for yourself.